Recognise the top? This sequin top has been my default Christmas outfit for the last 3 years and it's still going strong. See here and here. I love its bright colour, sequins and the fact that it hardly needs ironing. It also covers up one's upper arms a treat! 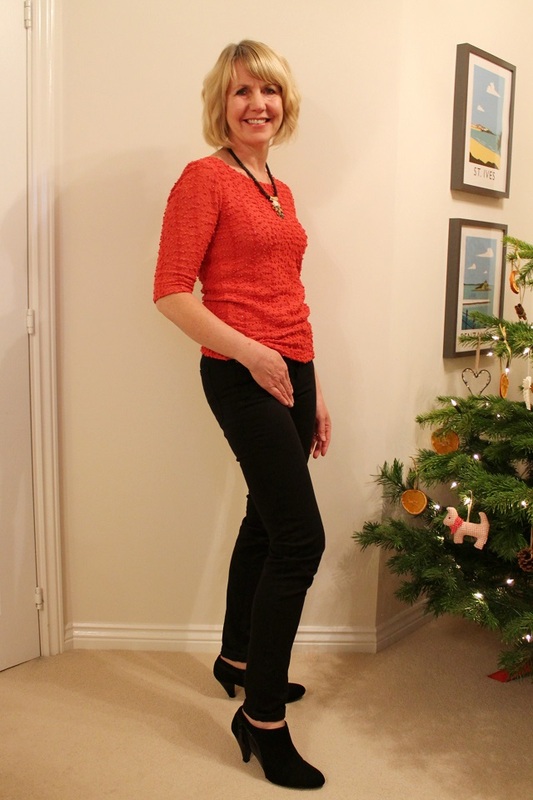 This 2014 I've been ringing the changes with a new necklace (New Look - yes) last year's Christmas present (M & S black ankle boots) and a last minute turn up of the hem (credit Eammanuelle Alt). Plus, my black Boden skinny jeans complied once more, eager to fight another day. Dub a dub a dum a dum (credit Jona Lewie). In other news my hair has been sulphate free since August and I've stuck at using alternatives to 'normal' shampoo for the last 4 months. However, it hasn't been easy. I wash my hair every few days with either hot water or an egg and occasionally with an organic shampoo. My hair feels greasy some days and I do still love the clean, swishy feeling of a thorough shampoo and condition. I may experiment further with the no-poo method in the new year. We''ll see. It's been harder than I anticipated. Whatever, I'm done with nasty sulphate shampoos and home dyeing my hair. Hello, new natural hair and colour (?) In the meantime, whilst my natural locks settle, I've been experimenting with adding curls to my bob. I asked my hairdresser to show me how. Here's his wonderful effortless work. We never can tell what year the Christmas pictures are from because I almost always have on my red/blue/white fair isle sweater. That's my go-to festive apparel. Cute hair cut. I too am SLS free - have you tried the L'Oreal Everpure and Everriche lines? 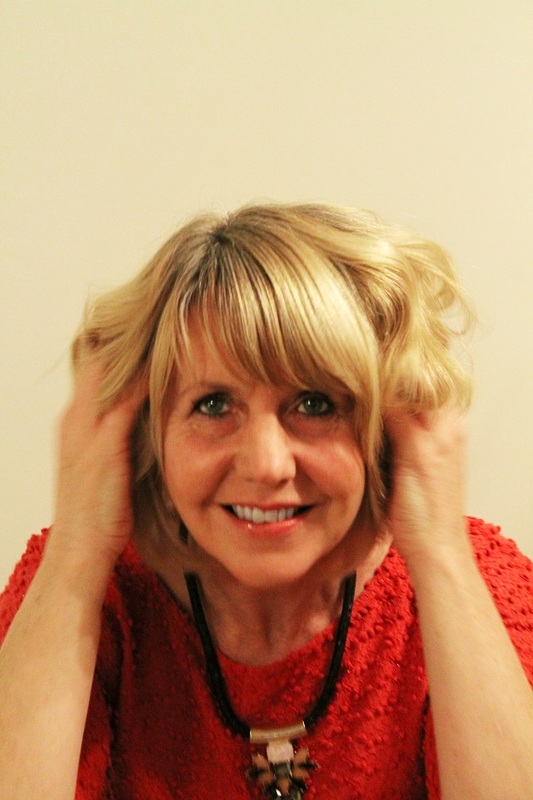 for a SLS free shampoo they are very good - when I get a bit of a build up I give my hair 2 shampoos and it seems to work. I use SLS-free toothpaste because the sulfates give me canker sores in my mouth. SLS-free shampoo leaves my hair feeling oily, though. I haven't found one yet that really leaves my hair feeling clean, but I'm still looking. Your Christmas outfit looks great and your hair is very pretty. are you near a Whole Foods Market? I bought shampoo in the one in Cheltenham and it was good. but I cant wash my hair more than every 3 days because it is curly and dry. Also with curling when you put the curl in. cup it in your hand and wait for it to cool. it wont drop as much. My sister does this with her poker straight hair. Claire it's Christmas Eve here in Australia and our family celebrates tonight so I'm going offline in a minute. Wishing you a very happy Christmas and a wonderful New Year! 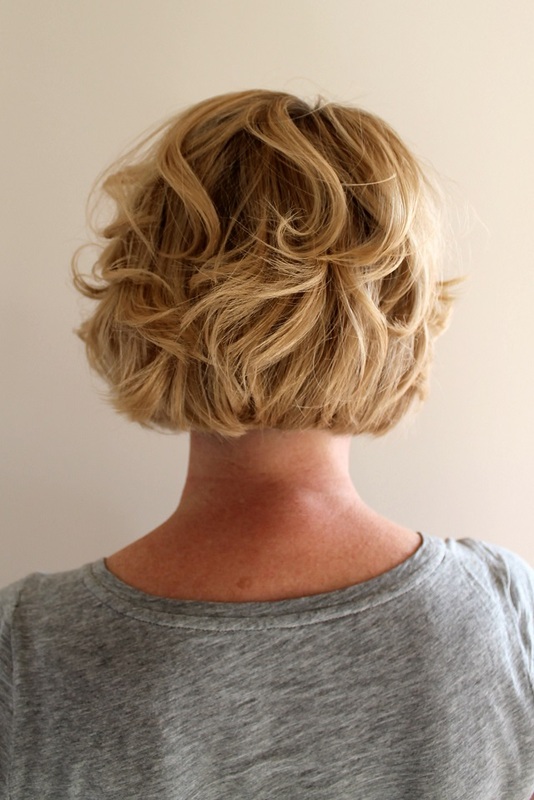 Wondering how you styled your wavy bob? Did you use a curling iron? mousse? spray of some sort? I would love to try it with my super straight bob. It's surprising how fresh and updated your outfit looks from last year, just with the different necklace and ankle boots instead of shoes.